Accent her super-special dress with this stylish pair of flats that will complement her look. A large flower accent adds charm to these ballet flats and will lift her style up a notch. Made with high-quality material, the flats are durable and versatile. The style and design go well with every outfit and every occasion. This classic pair features a buckle closure that ensures a just-right fit. Moreover, the flats have a soft, cushioned sole that will give your girl happy feet all day long. Crafted for style and comfort, the pair will bring an edgy flair to your girl’s ensemble. The bold colors with beautiful detailing will complete her ensemble and make her look spectacular. The ballerina flats are available in T5, T6, T7, T8, T9, and T10 sizes for toddlers. The youth sizes available are Y11, Y12, Y13, Y1, Y2, and Y13. In various vibrant, attractive colors, these flats will surely let your kid walk out in style and grace. So, get a pair now and see your girl jump for joy. Chillipop is a leading manufacturer of kid’s footwear and is known for providing premium quality rain boots in beautiful prints and colors. The collection of Chillipop’s footwear for girls and boys is in tune with the latest trends and style. Their footwear collection comes in all styles, shapes, patterns, and bright colors that are sure to charm kids. The brand focuses on the comfort of little feet with its high-quality materials and exclusive pieces. It has plenty to offer little kids who are looking for vibrant colors and perfect patterns. Finish Off Your Little One's Ensemble With These Classy Ballerina Flats By Chillipop: Give little feet the comfort they deserve with these dainty flats that features a flower accent on the top in lively, bold colors. Designed to perfection, these fancy flats will make your baby look her best at every occasion. The lightweight and breathable flats give your girl a one-of-a-kind look while keeping her relaxed at the same time. Unique & Trendy Design: Great for little ballerinas, these Chillipop flats for little girls showcase an elegant design that will add a graceful hue to her ensemble. The girls flats feature a strap design on the top with a flower to add a delicate touch to the pair. The captivating design will accentuate every outfit and is sure to charm your girl and her friends. Incredible Quality: Made with high-quality material, these girls shoes are specially designed for durability that will last through tough wear and tears. These easy-fit ballet flats for little girls deserve a place in your munchkin's footwear collection. This versatile pair will go with almost every outfit and adds a seamless look to daily wear. Comfortable & Secure Fit: Along with the appealing design, the girls flat shoes are designed to offer the utmost comfort to little kids. Whether going to a party or a day out, these comfortable flats will cater to your girl's every need and will keep her at ease all day long. The pretty ballet flats will dress up your baby girl in timeless style and uncompromising comfort. Various Sizes & Colors: These little girl ballet flats are available in toddler sizes T5 - T10 and kid sizes Y11-Y13 and Y1-Y3. 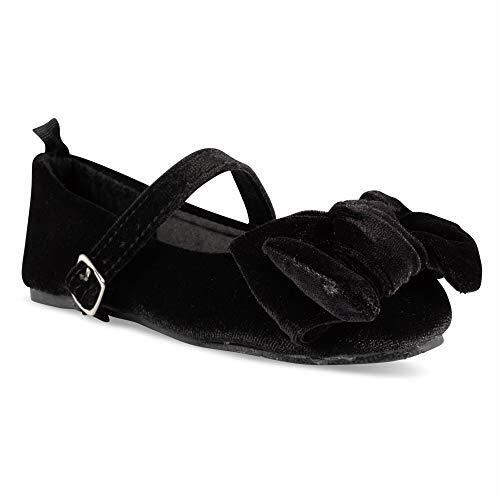 Furthermore, the girl dress flats come in beautiful colors - Black, Navy, and Burgundy. These bold colors will add a vibrant touch to your princess' outfit. Also, the right size will give her a just-right fit. Get a pair for her now and see her jump with joy! LITTLEGRASS 3 Pack Christmas Decorations Santa Sack Personalized for Kids Canvas Burlap Blank Bag Drawstring Special Delivery Extra Large Size Red Green White 27.5"x19.5"